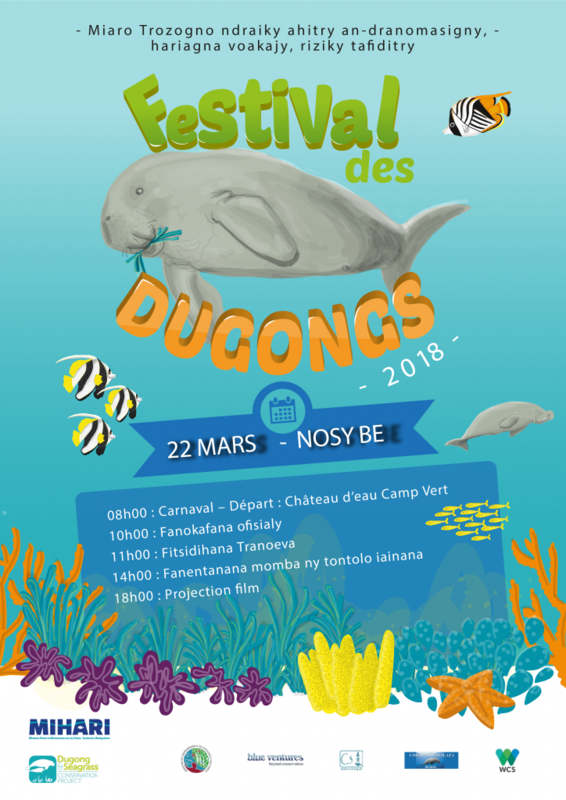 Celebrate dugongs with our partners in Madagascar on the 22nd of March 2018. This is the second dugong festival organized in Nosy Be. To celebrate the occasion, our partners there have produced two fantastic posters and are encouraging all of us to spread the word. This news article relates to the project entitled Building a model for long-term community-based conservation of seagrass-dependent biodiversity in Madagascar (MG1).. Click below to learn more about this project. This news article relates to the project entitled Fisher knowledge, awareness and behaviour change for the conservation of dugongs and seagrass using the Mihari network of Locally Managed Marine Areas in Madagascar (MG2).. Click below to learn more about this project. This news article relates to the project entitled Generating knowledge on dugongs, their critical habitats and threat reduction measures in North-west Madagascar (MG6).. Click below to learn more about this project. This news article relates to the project entitled Integrated approaches to enhance the conservation of dugong and seagrass ecosystems in the Sahamalaza area (MG4).. Click below to learn more about this project. This news article relates to the project entitled National Facilitating Committee for the GEF Dugong and Seagrass Conservation Project (MG5).. Click below to learn more about this project. This news article relates to the project entitled Using incentivized environmental stewardship to conserve dugongs and seagrass habitat at an identified national hotspot (MG3).. Click below to learn more about this project.